Some of you already know that I’ve purchased a Gotek drive for my Amiga 1200. For those who are unfamiliar with the Gotek, it is basically a floppy drive emulator that accepts USB-sticks. 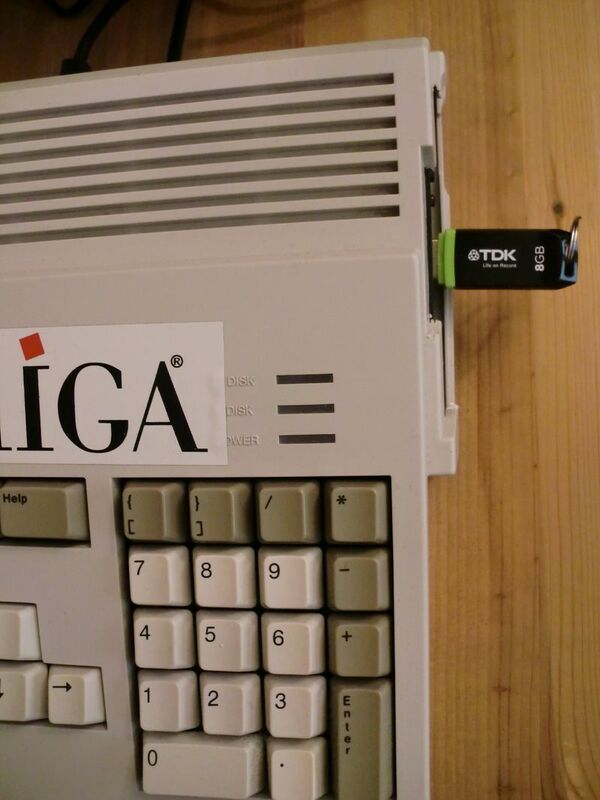 The Amiga believes it still has a floppy drive when the Gotek is installed and boots up an image called Selector.adf. This “disk” contains a menu from where you can run the games you have on your stick. Use your joystick to pick a game like Speedball 2 and the game runs after a restart. Brilliant! Getting the Gotek was not a problem. I found a link to KMTech Design in a YouTube video. It seemed like most people bought their Goteks from them, so I decided to do the same. It set me back approximately £20-25 and then I got it pre-flashed with cables. It arrived safely in a few days and instructions was included. Hooked it all up and it worked as it should. I had to cut a bit in the plastic of the A1200 chassis to make it fit inside. Many people choose to have it on the outside, but I like to have it compact. If you have problems installing the drive, there is a lot of help in watching some of the videos on YouTube where people show you how to do it. So, how do you put games on the USB-stick? Easy, just plug it into your PC, copy a bunch of games in ADF format to it and then plug it into the Gotek again. There is nothing more to it than that. You might want to sort your games into folders though, so it’ll list the files faster. I just made some directories like “Shoot’em Up”, “Sports”, “Platformers” and so forth. The most excellent thing is that you can assign games to slots in the Gotek. I’ve assigned over twenty games and they are all ready to run. I wrote a list on paper, so its always ready to use. If I want to play Sensible Soccer, I just use one of the buttons on the Gotek itself and stops when the LED shows 020, which is the slot on the Gotek for disk 1. You can do this with a ton of games and it is very handy, since you don’t have to access the games menu. And I must get a couple of new joysticks. I want a Konix Navigator and a ZipStik. Thanks for reading and hope you enjoyed this write-up about the Gotek. Anyone else has one or planning to get one? Thanks! And if you asked me, I would also vote for Gotek for A500. Yes, it’ll work better. I’m amazed I’ve forgotten how many games and demos fails on the 1200. Now that I re-experience this from the past it all comes back to me. I remember being so disappointed back then because Street Rod did not work. Also the truth. I’m now hungering for an Amiga 500, so time will show if I make the purchase or not. It is not very expensive and I don’t need any additional gear other than some extra memory, but that is most often included. I’ve been tempted for ages. I have a 1200 and was concerned about the compatibility. I assume aga games boot as a normal floppy but I do remember a lot of a500 games just wouldn’t run at all. Maybe I should sell the 1200 and get a 500 with 1mb of ram as it does seem like a better option as has been stated. Thanks for the nice words. Glad it was of help. 🙂 Enjoy the A500!